Spec list will be as follows when finished. Last edited by BertR00t on Mon Jan 26, 2015 1:31 am, edited 3 times in total. The RaceFace SixC that are on them are 725 wide and suit me perfectly. 725's, they look wider than that. At first glance I thought they were about 760+. Must be the angle they're on. I found garden wire the best way to get the cables/hoses through the swingarm. Getting the wire straight was a pain. Also on the hose side try and push the hose through with the grommet in place, braided hoses are an issue as they are a very tight fit. First ride yesterday and the shock is a bit springy, i.e. not damping enough on the rebound. Other than that size is good and feels nice to be astride it. Got the shock back off TFTuned today and went to work on it. Rode really nice but the saddle felt sloppy. Turned out my seatpost head was coming unbonded. Mate works at an importers so picked me a Thomson up for it tonight. Been out again on it and feels a lot more solid now, shock works perfectly in the frame. Absorbs small bumps, stairs and a few drop offs off short walls very well but need to try bigger stuff on it now so hopefully out somewhere decent next week. Can't do anything this weekend as my daughter is doing a triathlon and got a 50th birthday, etc so cannot give it a razz this weekend really. Loving this now. Had a good week on it. Running the shock a bit harder over the last few days and seems to be working more how I like it. Need to swap the bearings on the front wheel as there is some play so will get that done in the next few days. First rain in ages tonight so went for a razz in it. Loving it, feels a lot more raw than the Trek was. 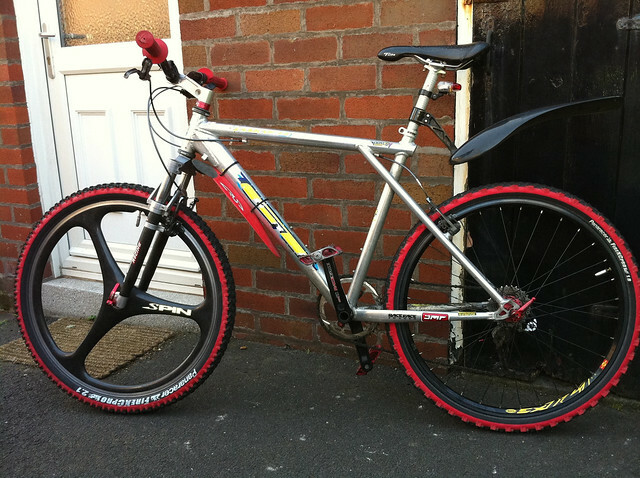 Needs a service, well forks do and rear hub needs bearings done but sorting that this week.